Brown is obviously correct, nothing could be more refreshing, innovative ‘real’ and ‘progressive’ than assigning the job to a man who has more blood on his hands than any other person in Europe. It may also be right to argue that there is just one living person on this planet with more blood on his hands than Blair. That man dwells in Texas, his name is George and actually unlike our Bonaparte figure, he keeps relatively quiet. Unlike George, our Boney is craving for recognition, he cannot live without a crown or an official title. Someone should remind Boney that he already made it into history, he can really take a break. With more than one million fatalities in Iraq, he is not far behind Hitler and Stalin. Murderers are, no doubt, a unique bunch of people, some criminologists insists that they are no less than psychopaths for psychopaths are people who disregard ethical principles. Psychopaths also lack any sense of conscience or compassion. Mass murderers are even more special, for they manage to evade, not just a couple of eyes, but rather very many. They even mange to turn deaf to public criticism and resentment towards their acts. Our Boney, is extraordinary by every possible means. Not only does he dismiss the pain he brought on millions, not only did he fail to show regret, he actually constantly demands our recognition of his imaginary greatness. He seems to lack any awareness or self-consciousness whatsoever. While the majority of Europeans would prefer to see Boney schlepped to The Hague, face justice and hopefully locked up for life, he himself must be convinced that he possesses the necessary qualities for the European Presidency. From a united European perspective he was a light disaster. He managed to keep Britain out of the Euro, he also didn’t follow the Schengen open borders agreement. From a British perspective Boney was a total disaster. Together with his ‘best Treasurer ever’ he succeeded in ruining the Britain economy. He smashed the last pockets of British industry to infinitesimal pieces and on top of all that, he has managed to get all of us implicated in a war crime of a colossal magnitude. This was probably enough to make European leaders think again, They have now decided to restrain Boney’s self centric enthusiasm and relentless will to power.. However, Blair is not alone. As much as recent polls suggest that the vast majority of Brits find him unsuitable to the European presidency, in his rapidly disintegrating Nuevo Labour, he actually has some dedicated followers supporters and allies. According to the British press he asked Lord Mandelson to act as his ‘chef de cabinet’. In the last decade alone, Mandelson has had to resign more than once for his misconduct. Mandelson has also recently been exposed as having close ties with one of Russia’s leading Oligarchs. A person of such a low ethical reputation at the hub of the European Union may well be a danger for the entire continent. Another of Blair’s close allies and supporters is Foreign Secretary David Miliband who launched Boney’s campaign for presidency with the extraordinary claim that only Boney could 'stop the traffic' when he goes to foreign Capitals. Like Boney, Miliband is rather enthusiastic about interventionism and ‘spreading democracy’. It is hard to believe but in Britain in 2009, the Wolfowitz doctrine is still making headlines especially amongst the so called ‘progressive’ politicians. I have learnt in recent days that Miliband is himself a leading candidate for the European Foreign office. I urge every European leader to look into Miliband’s Neoconservative ideology and amend their choice before it is too late. Until recently Miliband managed to keep his Judeo-centric tribal affiliation to himself. This is not the case anymore. Facing an inevitable colossal electoral defeat for Labour, Miliband just couldn’t hold back. A few weeks ago he decided to pull the Jewish rabbit out of the of the Nuevo Labour sack. In a desperate and crude attempt to evoke public pity and empathy, he warned the British public that the coming Tory leadership is affiliated with notorious ‘Anti Semites and Neo Nazis’. Miliband has managed to drag Poland's chief Rabbi into the British political discourse. From Miliband’s tribal perspective, it is down to a Polish rabbi to suggest to the British people who is kosher enough to vote for. At least Miliband’s philosophy of mutual intervention is consistent: As much as we, the Brits, should tell the world who is moral and what is wrong , it is down to a Polish Rabbi to tell us who to vote for. But the paddling in pseudo liberal Nuevo Labour chicken soup may not end just there. It would be intriguing to find out what kind of a job Boney has assigned to his Number 1 Lord Cashpoint Levy. I would also like to know whether ‘Liberal’ Jack Straw, the man who insisted to strip Muslim women of their Veil, had any potential assignment in Blair’s presidential administration. At the end of the day, Straw could extend and expand his dismissal of others to the entire continent. Blair was sure that he had the presidency ‘in his pocket’. He was wrong, it is now rather clear that European leaders have woken up. The horrifying dream may be over. I guess that the idea they would have to stop the traffic in their Capitals just to let the convoy of a vile war criminal pass through was too much for them to cope with. 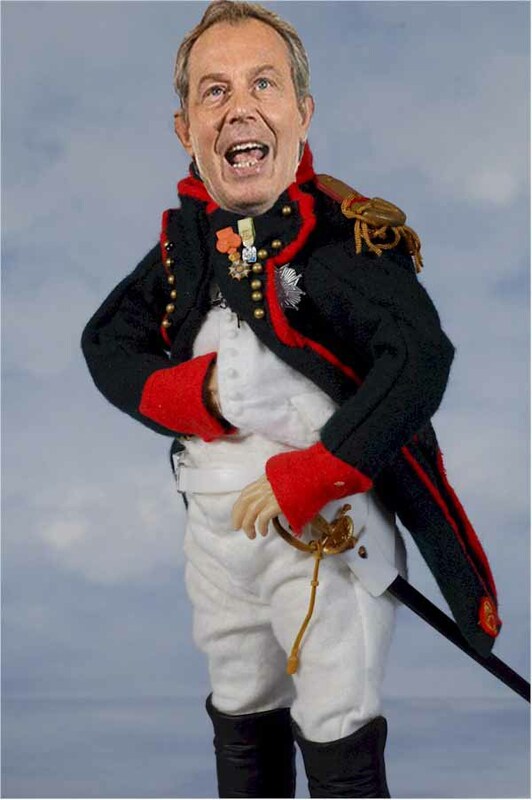 Blair as a European president could be a total farce, almost as sickening as him being ‘Peace Envoy’. I assume that all we have to do now is to pursue immediately the necessary action that would lead this criminal to face justice and to bear the consequences of his illegal war.